What we call a Gothic V. Nope, it's not a guitar. Nor is this a font type for a vampire clan. 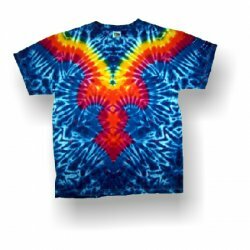 It is a fancy pattern that was based on a V fold tie dye, but stepped up to whole new level of coolness. A yellow orange and red "V" pattern surrounded by a blue and purple crinkle background. 6.1 ounce. Seamless collar. Taped shoulder-to-shoulder. Double needle stitching. Quarter-turned. Fiber reactive permanent dye. Handmade tie dyed T-Shirt. Sizes: S-M-L-XL-2X-3X-4X.